Kalandra Jane - Millinery and Musings! 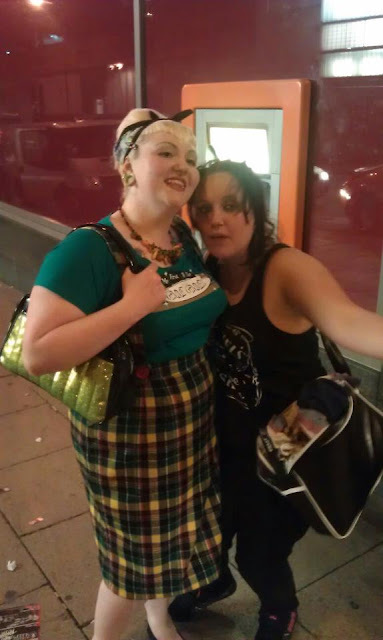 : In which I have a fangirl moment over NOFX, and show you my amazing skirt. In which I have a fangirl moment over NOFX, and show you my amazing skirt. I just realised I haven't blogged in nearly a month! I'm sorry, my dears, it's not that I've had nothing to report, I've just not had much motivation, I must have needed a little break but am back now! 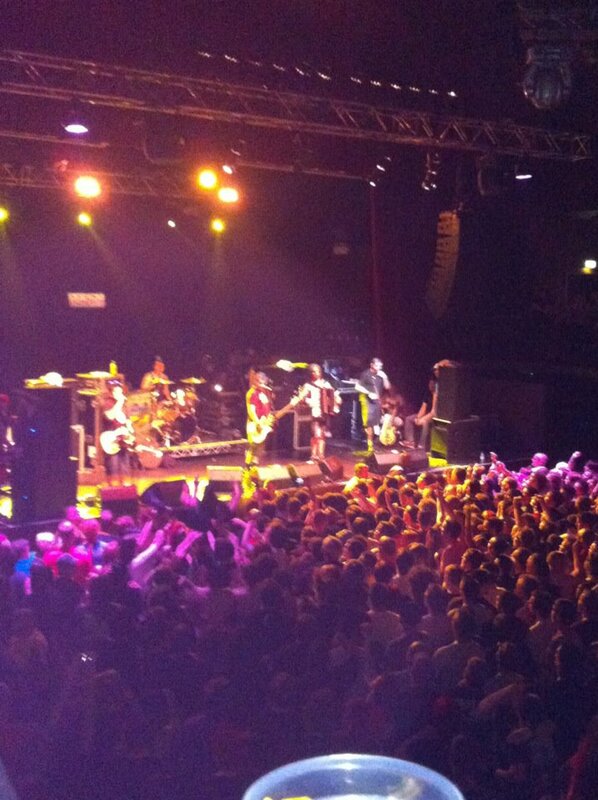 Last week we went to see NoFX at the Ritz in Manchester, they were amazing! They have been my favourite band since I was about twelve, I've seen them twice before but they've gotten into the habit of doing crappy metal festival gigs like Download rather than proper tours, so I jumped at the chance to see them in a smaller venue (the Ritz only holds a few hundred at most). This is where I was standing. Support was from Snuff who are still going strong, Paul was more excited to see them than NoFX, being a child of the early nineties punk scene rather than a whippersnapper like myself. 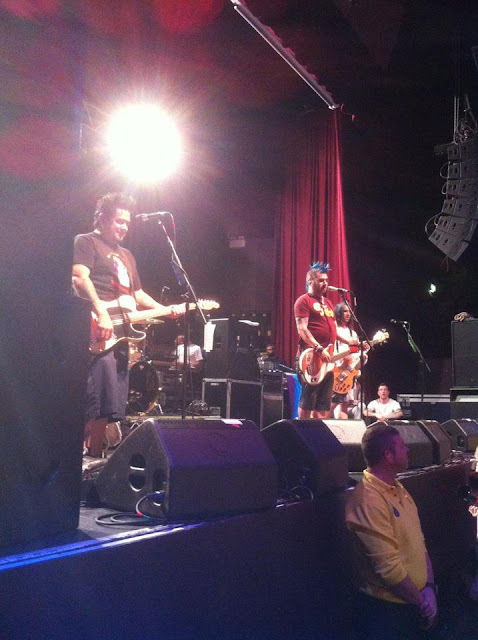 Last time I saw NoFX, in 2006 (or maybe it was 2007) they weren't that good, possibly due to their excessive intake of tequila-soaked carrot sticks and cocaine, but this time they were spot on. I got a place right down the front - see those blue, red and white blobs in the bottom left in front of the speaker? That's our friend Paul, my Paul, and my fantastical voluminous beehive hair. The hair that prompted Fat Mike to take a break from playing and singing to compliment me on it and gaze at it in wonder, and which contained such copious levels of backcombed, hairsprayed fuzz that it protected my head like a crash helmet when I got booted by a crowdsurfer. 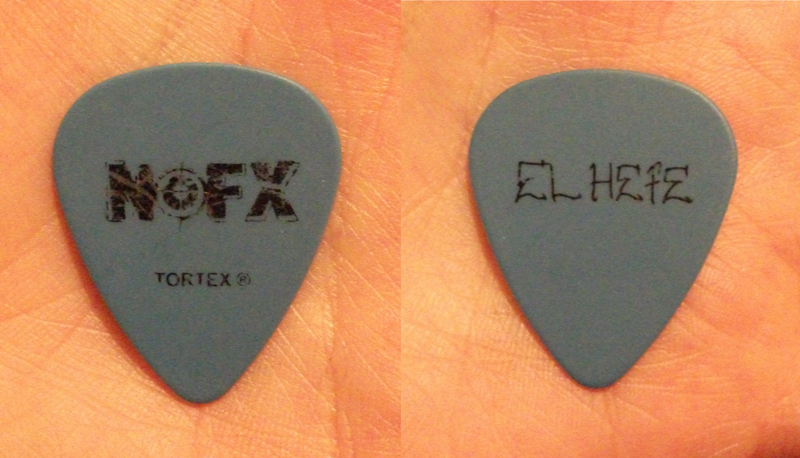 Here is my plectrum from El Hefe, he was highly amused by my fringe and eyebrows. Yellow tartan skirt with braces! This is actually version two, I made one in September and loved it, but I made it a bit too tight and the loose weave fabric just pulled away at the seams. This is hopefully a more robust version that can accommodate the strain of encasing my gigantic rear. This is probably my favourite thing I have ever made, I have worn it every day since, it needs to go to the dry cleaner - there's only so many times you can air something out before it becomes a bit wrong to continue wearing it. New fruit hair tie from Clare at Dolly Cool, it's got an AVOCADO on it! My vegan joy knew no bounds when I saw its avocado goodness, and Clare was lovely enough to let me have it after we did a stall together at Big D's Ink, Iron and Hot Rod Show. This was from vintage fabric that she also made into a fabulous circle skirt! Yay! I love Me First....went through a phase of listening to them ALL the time a few years ago...shame they don't tour more...and if they do its always only London, boo. Date night outfit, and I really need a haircut!